Cassava is a nutrient-dense, starchy root vegetable native to South America and commonly consumed in developing countries. Cassava is also often known as yucca, manioc, or mandioca. When cooked, cassava has a similar texture to potatoes. Although its tuberous roots are used to make cassava flours, breads, and tapioca, cassava can be eaten raw or cooked in a variety of ways. Cassava is a calorie-dense source of complex carbohydrates—in fact, 95 percent of its calorie makeup comes from carbohydrates. It is relatively low in sugar, with less than 2 grams per serving. This shouldn’t be bothersome to most people, though, as it’s most commonly enjoyed as a savory side rather than something sweet. Cassava also isn’t very high in fiber, which is also just 2 grams per serving. Cassava has virtually almost no fat, with less than 1 gram in its total fat content per serving if you enjoy it raw or boiled. The same goes for monounsaturated fat, polyunsaturated fat, and omega-3 fatty acids. However, keep in mind that if you choose to fry it before eating, added oil is undoubtedly going to significantly increase the fat content per serving. While cassava leaves have been shown to contain protein, it’s a very small amount (less than 2 grams per serving) that doesn’t cover a significant portion of the protein you should aim to consume each day. As such, cassava is best used as a side dish to accompany an animal or plant protein-based main dish. In addition to being an excellent source of complex carbohydrates, cassava is also known to be a good source of thiamin, folic acid, manganese, and potassium. Its roots specifically are known to be high in calcium and vitamin C, while its leaves have been found to come with lysine and carotene. Cassava has been used in alternative medicine to treat conditions such as arthritis, conjunctivitis, diarrhea, flu, and headaches. Although research is limited, cassava has also been thought to boost fertility, prevent cancer and reduce inflammation. Can Cassava Be Eaten Raw? 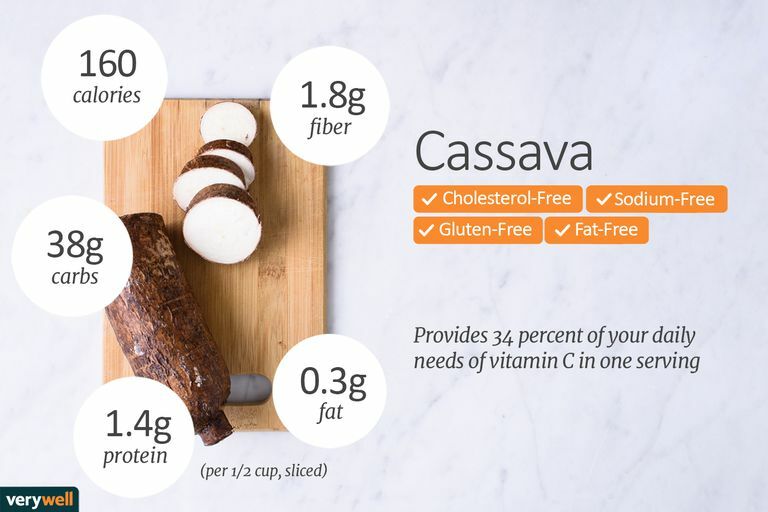 While on the whole, cassava contains a variety of nutrients, its nutritional value is drastically reduced when it’s cooked or processed rather than being consumed raw. At the same time, it can be dangerous to consume it raw in large amounts. Cassava has been shown to release cyanide (a poisonous substance) when eaten whole, so while cooking it thoroughly might kill off some of the nutrients, it’s also safer to eat and will likely taste better, anyway. Is Cassava Healthier Than Potatoes? Like potatoes, cassava has a high starch content and very little fiber. However because it’s very low in sugar and contains a variety of other nutrients, it can have a place as a carbohydrate-rich side dish in a well-balanced diet. Simply pair it with a source of animal or plant-based protein, along with fiber-rich vegetables like leafy greens, bell peppers, or a salad. Cassava can be cooked in a variety of ways. You can boil and mash it with garlic and butter similarly to mashed potatoes, or you can bake or fry it in thick chunks or thin strips to eat in the same form as fries or chips dipped in chimichurri sauce, a South American recipe made with parsley, minced garlic, olive oil, oregano, and red wine vinegar. If you are allergic to cassava, you can simply opt for traditional potatoes or sweet potatoes in its place as a side dish. There is no available research showcasing adverse food and drug interactions. Montagnac JA, Davis C, Tanumihardjo SA, Nutritional Value of Cassava for Use as a Staple Food and Recent Advances for Improvement. Comprehensive Reviews in Food Science and Food Safety. June 2009. DOI: 10.1111/j.1541-4337.2009.00077.x. Cassava. USDA National Nutrient Database. What Are the Nutrients in Cassava? Healthy Eating.